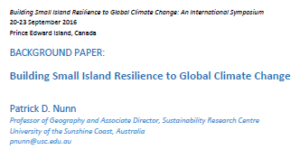 In order to ensure that all speakers and participants were starting from the same understanding of climate change and islands, the Symposium commissioned Dr. Patrick D. Nunn, Professor of Geography and Associate Director of the Sustainability Research Centre at the University of the Sunshine Coast in Australia, to write a 7,000-word Background Paper, which was circulated prior to the event. The paper describes how islands are different from continents, the differences and similarities among islands, some of the ways in which islands have been impacted by climate change, and some opportunities and challenges for islands in the face of climate change. It also includes several key questions, which formed the basis for a series of dialogues during the Question and Answer sessions over the course of the Symposium.